With thanks to Graham Smith for providing the scan. 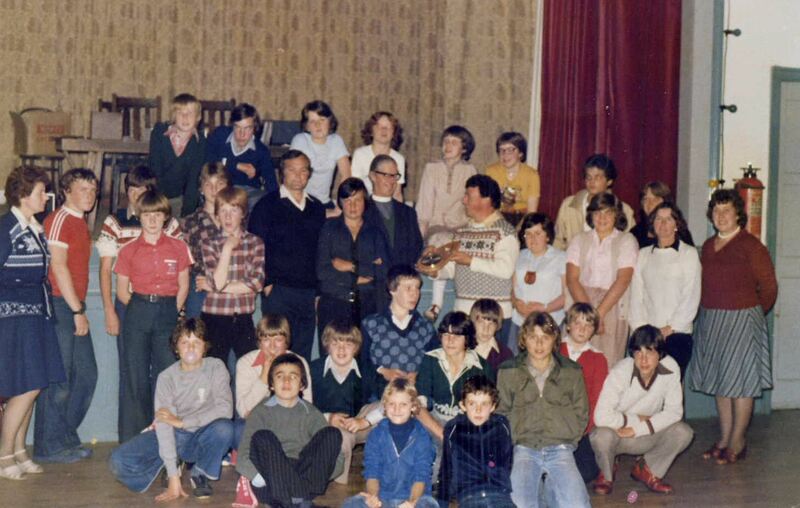 Photo taken May 1977 at the 11 Plus Club which met every Sunday evening in the Village Hall between 1975 and 1980. I would love to hear from anyone who has any memories or old photos of the 11 plus club (youth club) which ran every Sunday evening in St Thomas' Hall (Village Hall) from 1975 until I think 1980. A great evening for all the local kids every sunday with music, pool, various games and yearly competitions. Two sets of parents used to watch over the kids every week, and the kids could take turns every week to DJ. The weekly attendance would be around 30 kids aged 11 to 16. Gary Williams, Graham Smith, Joyce Sessford, Andrew Sessford, Carl Cook, Ken Hill, Jeremy Stones, Mr Fox (the vicar), Jack Sessford, Sandra Robinson, Tim Oakman, Nona Hill, Glenys Smith, Betty Green, Simon Smith, Paul Williams, Darren Green, Ian Lloyd, Darren Wild, Paul Harrison, Andrew Briggs, John Turton, Stephen Turnball, Stephen Smith, Lee Duxbury, James Mccormack, Jonathan Broughton. I managed to remember 27 of the names, there are seven I cannot remember including the four girls on the back row next to me (Graham in the blue jumper). Two lads in red tops I cannot remember names of also. Alan and Glenys Smith (my parents), Ken and Nona Hill, Mr and Mrs Green and Mr and Mrs Sessford. The photo was taken by Alan Smith. Red t shirt on left, possibly Richard Thompson (Holme Farm). Girls on back row, blue top Amanda Palfreman, white top possibly Julie Stone (Jeremy's sister). Black hair in front of Simon Turnbull is John Turton. The boy in the red top with white collar sat on the floor is Richard Smith, brother of Simon Smith who is also in the photo.